Go into Colovian Traders. Waiting around inside during the day, you should find a Nord woman named Eyja. 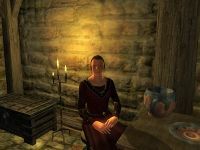 If you have purchased Rosethorn Hall and the Servants Quarters Upgrade, she will approach you and talk about working for you. You can also look for her. Give her 150 gold and she'll move in. Eyja will be found in her quarters in the basement most of the time but wanders the house during the day. If you have bought the Kitchen Upgrade talk to her about food or drink and she will provide you with seemingly limitless Shepherd's Pie and Rosethorn Mead. Esta página foi modificada pela última vez à(s) 17h43min de 12 de maio de 2015.